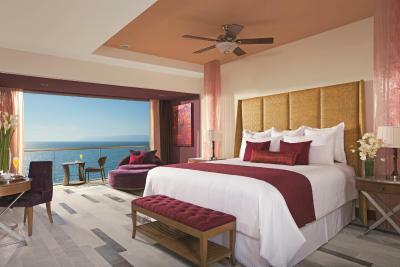 Lock in a great price for Secrets Vallarta Bay Resort & SPA - Adults Only - rated 9 by recent guests. We booked a preferred junior suite with see view. This room was spacious and in a good condition. Only the bathtub outside is a bit dated (and didn't work in the beginning). Pool area is nice. There is a good coffee bar with strong coffee close to the entrance. This resort is top notch, premium everything . . . food, drinks and staff. For whatever extra you may pay it's totally worth the few extra bucks for the quality. Been to over 20 all inclusive in years past and this was by far the best. We found the food very good everywhere and especicially the Oceana where Heirburto was very accomodating and hospitable. We had some of the best steaks and seafood ever at this resort. Staff was really friendly and helpful. Got some great recommendations for restaurants around town. Wonderful place to stay. All the staff works amaizing. Especially I would like to thank to Juan - the happy waiter who made our stay very pleasant and Rolando-who guided us on the first day. Also great guys at the breakfast. The best breakfast when you want to celebrate :) I would like to come back again! Luxury vacation. Service was incredible throughout the resort. 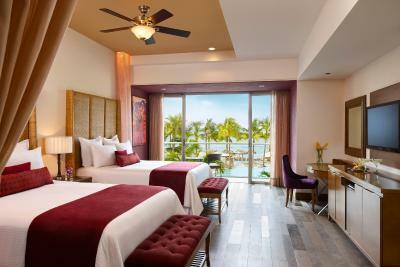 Every room is ocean front and the view can’t be beat. The property was absolutely beautiful! And the staff was just amazingly friendly. The buffet: Food and service were wonderful. 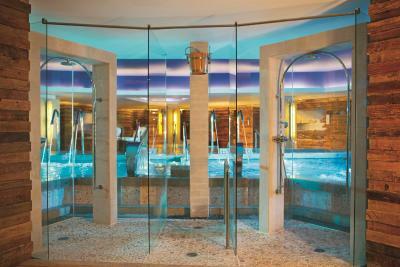 The staff was very friendly and accommodating. The Bordeaux Restaurant: Wonderful food and service. The Pool Servers: Very friendly and attentive. Beautiful property. Very well maintained. Rooms were serviced daily and even included turn down service. Close to town and airport. One of our top picks in Puerto Vallarta.Situated on the golden sand beach right on the Pacific coast and located just minutes from the famous 'El Malecón' boardwalk. 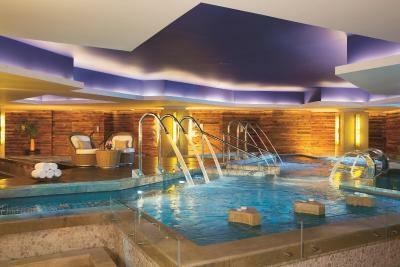 Secrets Vallarta Resort & Spa boasts a world-class spa and an outdoor pool. Guests can also enjoy free WiFi, free calling and the ability to book excursions. 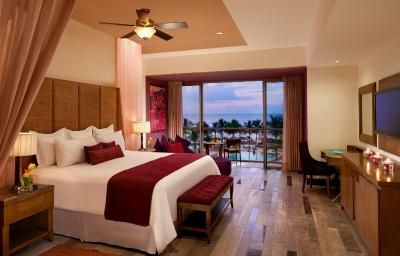 The well-appointed rooms offer ocean views, contemporary décor and marble floors. Each elegantly-appointed suite is complete with 24-hour room service, Secrets Box for private room service delivery, turn down service, mini-bar refreshed daily, bathroom with shower and hot tub. 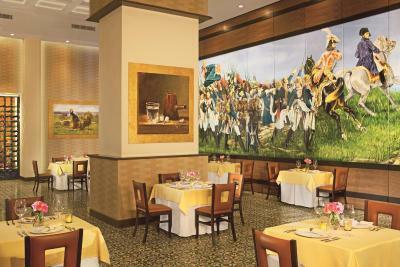 Guests can dine at reservation-free gourmet restaurants and bars. 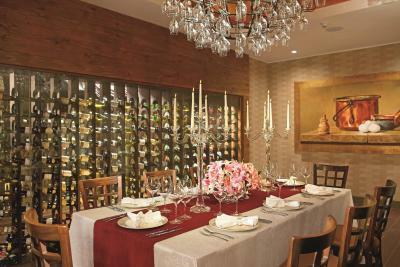 Each restaurant offers a unique cuisine, ranging from exceptional Pan-Asian delights to elegant French fare. 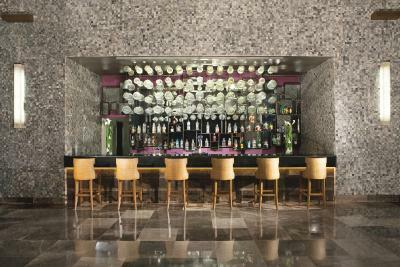 Relax with your favorite cocktail at any of the three lively bars, featuring premium brand domestic and international brands. 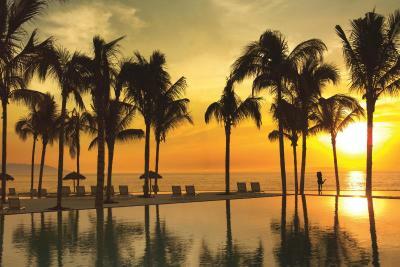 The centre of Puerto Vallarta is just over 0.6 miles from the hotel. The city’s airport is a 5-minute drive away.. 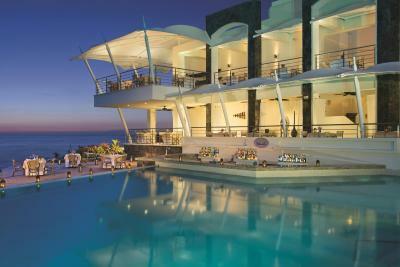 Secrets Vallarta Bay Resort & SPA - Adults Only has been welcoming Booking.com guests since 2 Feb 2012. 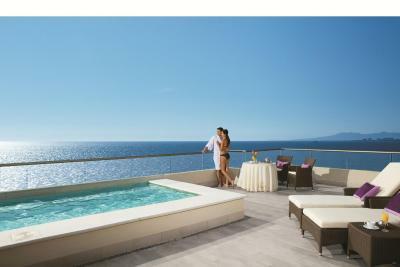 When would you like to stay at Secrets Vallarta Bay Resort & SPA - Adults Only? 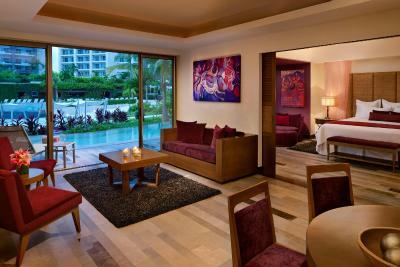 This spacious suite has bright, modern décor and offers garden views from its balcony. 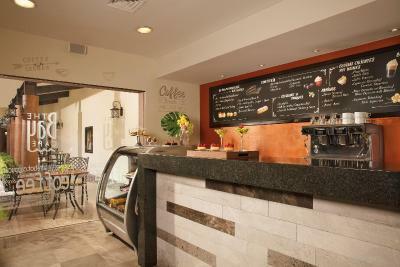 It features free Wi-Fi, a flat-screen TV and a coffee maker. There is also 24-hour room service, a room service delivery box and a minibar. 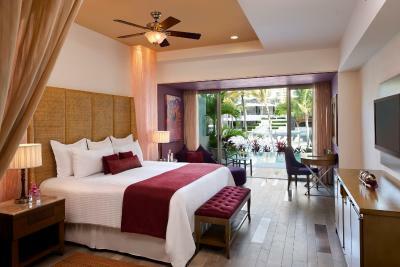 This spacious suite has bright, modern décor and offers ocean views from its balcony. It features free Wi-Fi, a flat-screen TV and a coffee maker. There is also 24-hour room service, a room service delivery box and a minibar. 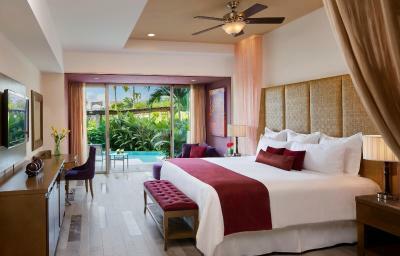 This spacious suite has bright, modern décor and offers garden views. It features a terrace with a hot tub, free Wi-Fi, a flat-screen TV and a coffee maker. There is also 24-hour room service, a room service delivery box and a minibar. 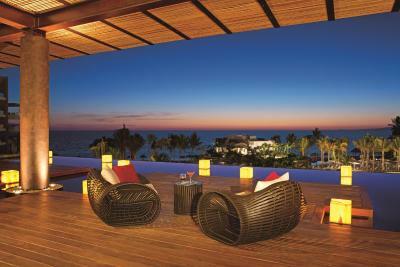 Guests receive VIP status within the hotel, as well as access to a private lounge and exclusive bar access. Newspapers, magazines and a pillow menu are also included. 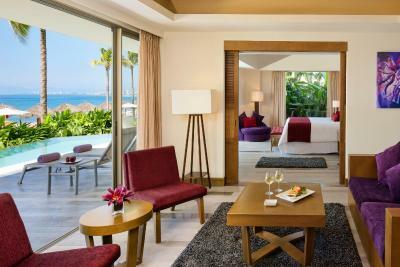 This spacious suite has bright, modern décor and offers ocean views. It features a terrace with a hot tub, free Wi-Fi, a flat-screen TV and a coffee maker. There is also 24-hour room service, a room service delivery box and a minibar. This spacious suite has bright and modern décor. It features Wi-Fi, a flat-screen TV and a coffee maker. There is also 24-hour room service, a room service delivery box and a minibar. 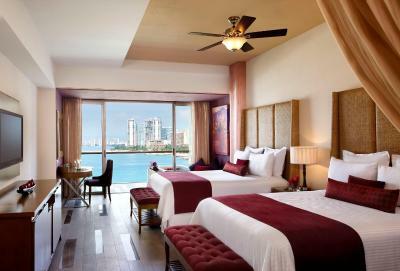 This suite features air conditioning, tile/marble floor and sea view. This suite has a sofa, iPod dock and tile/marble floor. 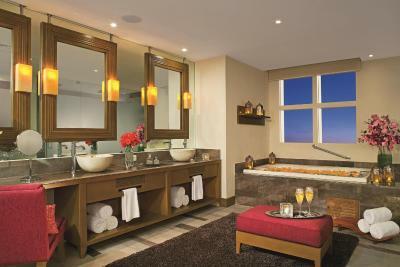 This suite features a cable TV, bathrobe and tile/marble floor. This suite has a iPod dock, minibar and bathrobe. This suite has a bathrobe, minibar and iPod dock. This suite has a satellite TV, air conditioning and tile/marble floor. This suite features a iPod dock, cable TV and bathrobe. Room type is defined upon check-in. 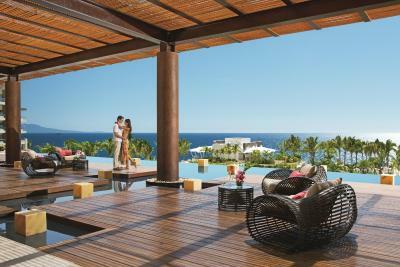 House rules Secrets Vallarta Bay Resort & SPA - Adults Only takes special requests - add in the next step! 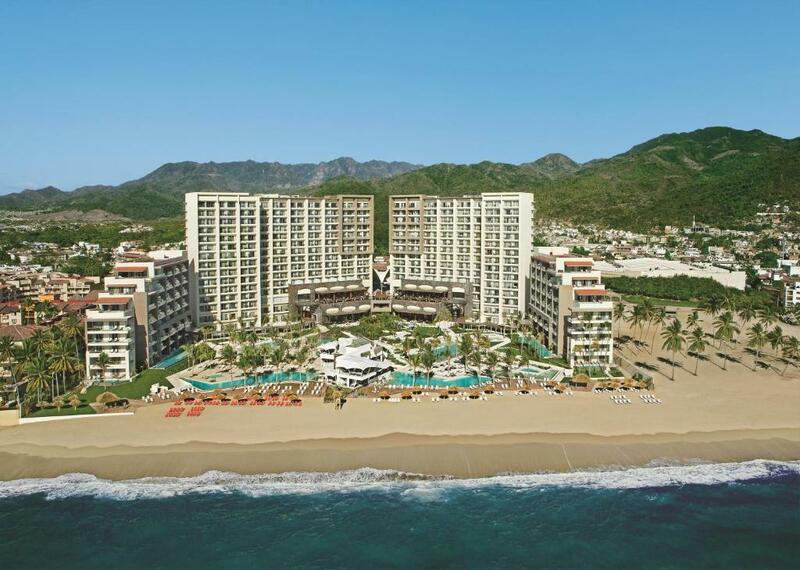 Secrets Vallarta Bay Resort &amp; SPA - Adults Only accepts these cards and reserves the right to temporarily hold an amount prior to arrival. 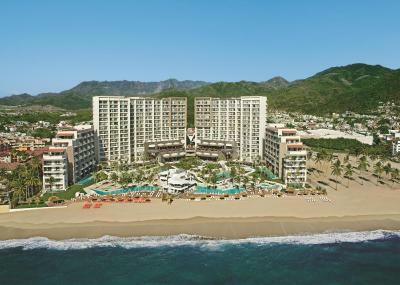 Secrets Vallarta Bay Resort & SPA - Adults Only accepts these cards and reserves the right to temporarily hold an amount prior to arrival. They allow chair hogs to reserve lounges by the pool starting early in the morning. Seats sit empty with stuff on them for hours. Ridiculous! All chairs taken by 9 AM. The constant upsale while on property. 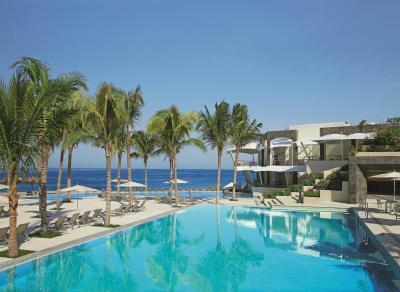 We chose an all-inclusive resort in order to relax and not have anything to worry about anything. The staff would patrol the resort during the day and try and upsell for many things at the resort like spa services, dining reservations and liquor. Kind-of put a sour note on my relaxing. Tamarindo Restaurant: Located on the Now Amber side. We didn't care for the margaritas. We couldn't even drink them. Service was lacking. Food was good but not good enough to give them another try during our stay. 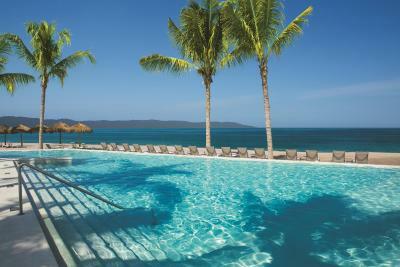 Beautiful bay front setting, excellent facilities and staff. I have no qualms. Everything was great! First time staying at a resort and I came for an NYE concert in the area. 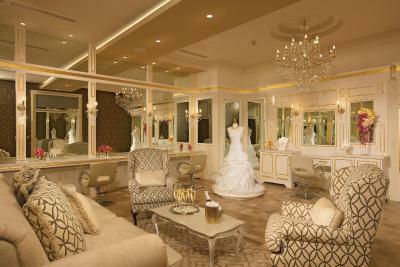 The staff, every single person was friendly, helpful and attentive. 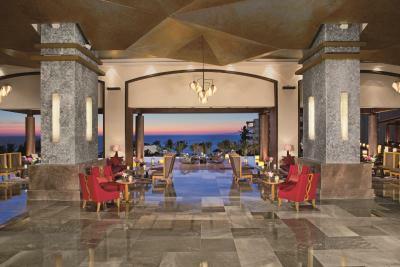 I loved hanging out in the lobby enjoying the breathtaking views of the ocean. I liked how if one restaurant was closed, there were other options just a short walk away at Amber Resort. When booking I had no idea they were neighboring resorts, which is cool too. I loved my room. The lighting and view was great. You have a mini fridge that's stocked with soda, water and Coronas and the beds were comfy. I appreciated the option to have my room turned down and freshened up if I wanted it...so it was nice coming back to a room that felt like I was just walking in for the first time. There is a little convienent store and it has all the little things you may need (of course at a reasonable price) like Advil, Tums, Tylenol, razors, anything that you may need in a pinch. I could go on, but I really liked how they have taxis waiting OR someone will call you a taxi to head into town. The staff truly makes it easy to just relax and enjoy your time however you decide to spend it. Pools were not heated. Hot tub at secrets was insufficiently warm. Now Amber hot tub was better. There was too much noise from music at the pools. It was hard to hear the ocean! Well, it was our third stay in a Secrets and first time in this one. To be honest it's also going to be the last one. The concept of Secrets would be great if they would nail it, but unfortunately they don't. My remarks: - Employees are tip driven and therefore very fake. I'm sorry to say that. Espacially a remark regarding Diana at the preferred club: she prefers not to work at all. 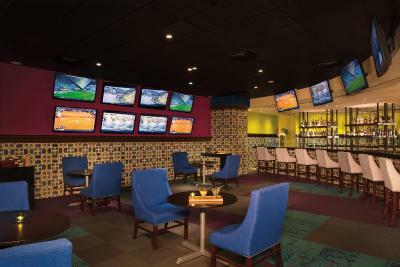 - Preferred club benefits are limited and there is no check (everybody can enter the lounge for example). 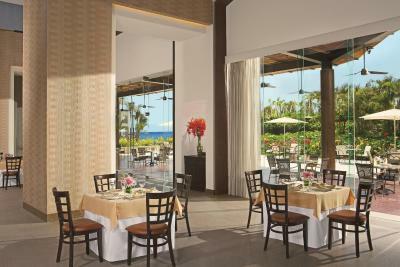 Also the lunch places exclusively for prefered guests are not checked regularly. - In the rooms sometimes towels were missing, minibar wasn't filled up completely, bath tub didn't work in the beginning. - The hotel tries and tries to sell you bottles of wine (and other spirits, even at the beach...) at any occasion. In some restaurants they assigned areas where you can only sit if you purchase a bottle... - Waiters promote drinking: in the morning during breakfast, without asking, we got a shot of baileys served next to our cappuccino . Excuse me? - Regarding food: you will see a huge variety in the reviews, but in general the food is overrated. Buffet is even better than a la carte. Especially during lunch everything is very "fast food" and therefore greasy. - The hotel offers late check out for preferred guests (based on availability), but be ready that there is no availability. - The hotel is a fusion of two hotels of the same chain: the other one is called "Now". 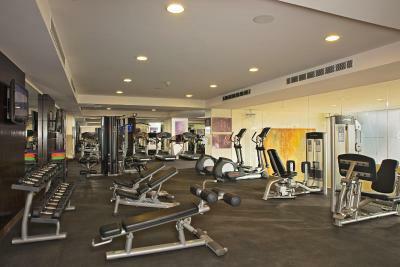 Hotel guests can use the facilities of the other hotel. - Again too many Americans that mess the whole place up (drinking from early morning, very noisy etc.). - Beach is not beautiful at all and rocky when your enter the sea. 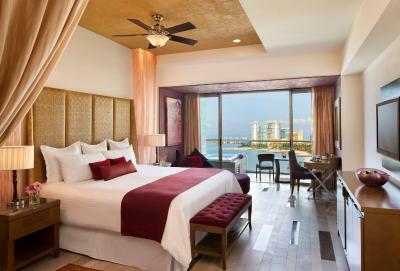 - One more thing regarding the room: we booked see view, but seems that regular rooms in this hotel have a frontal see view while the preferred junior suites have a side ocean view. We had to look around the corner. The only thing that could’ve been better at the NOW restaurants. The way the staff greet you when you first arrive and every time you arrive.